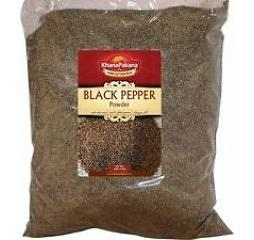 Black pepper ground is made from whole black peppers. Black pepper is native to South India and is commonly used on dishes throughout the world. This spice has a hot pungent taste and penetrating aroma. Use the powder to bring depth to vegetables, meat dishes, enhances the flavor of eggs and excellent for seafood. This item in Indian Herbs & Spices category was first added to our catalog on 03-26-2016. Buy Black Pepper Powder 3.5oz (4 Pack), sold & shipped by Desi Wholesale where you can shop online for Quality Indian Groceries, Spices, Dals & Snacks @ Lowest Price. This Spices & Herbs collection has been tagged as Groceries, Indian Spices, Masala, Black Pepper.